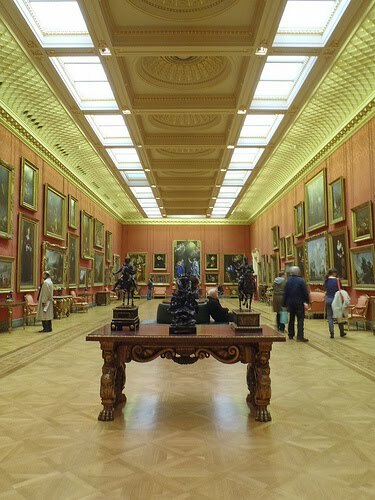 The Great Gallery at Hertford House, the home of the Wallace Collection, and is home to many of great seventeenth-century paintings from the Old Masters. The paintings in the space were collected from various European schools by the 4th Marquess of Hertford, and other members of his family, and are now exhibited daily for free as part of the Wallace Collection's unique offering. Perseus and Andromeda and Rembrandt's Titus, the Artist's Son. The collection is free, and is open from 10am until 5pm, every day except 24th, 25th and 26th December. For more information on the Great Gallery, click here. Situated directly beneath New Zealand House, in the Royal Opera Arcade, Kiwi Fruits is a shop which began in 1983 and aims to supply homesick New Zealanders with everything they might need from the motherland. Most of their offerings are imported directly from New Zealand, with everything from books to food, magazines, native wood crafts, ceramics, souvenirs and jewellery. They even stock traditional bone and pounamu carvings. Aiming to be a home away from home for New Zealanders in Europe, your author really enjoys these type of shops. It is always very interesting to see people from any country try to create a piece of home in a new land. 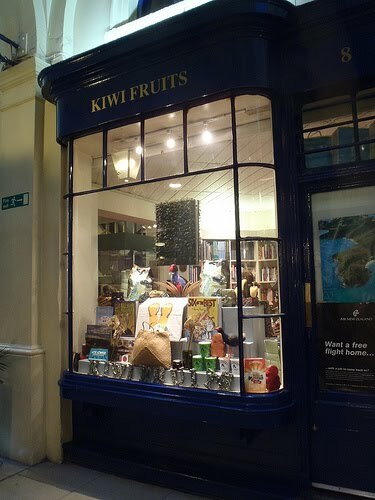 For more on Kiwi Fruits, see http://www.kiwifruitsnzshop.com or pop in. Often overlooked due to its funny shape, sports pitches, and proximity to nicer parks, Haggerston Park was previously an industrial area, and the northern half of the site only became a public park in the late 1950s, whilst the southern half wasn't developed for public use in the 1980s. The industrial part of the park was, according to Wikipedia, once home to derelict housing, a tile factory, and the old Shoreditch gasworks, which had been damaged by a German V-2 rocket in 1944. One slightly bizarre footnote to its history is that this park was apparently once used by Michael Jackson to land a helicopter with Mickey Mouse and Minnie Mouse whilst visiting the now closed Queen Elizabeth Hospital for Children. 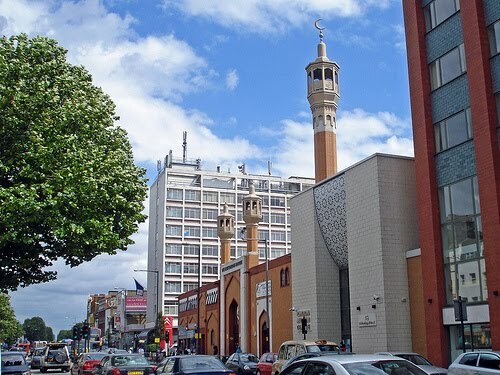 Your author noticed the other day, in the course of his daily browsing, that the East London Mosque and London Muslim Centre, on Whitechapel High Street, are open for visitors this weekend. Given that this is part of his daily commute, it seems too good an opportunity to miss. The Mosque itself is one of the largest in UK, with a capacity of up to 5000 people. It opened in 1985, and took around three years to build. The London Muslim Centre, meanwhile, is a much newer development having been constructed between 2002 and 2004, at a cost of around £10.5m. 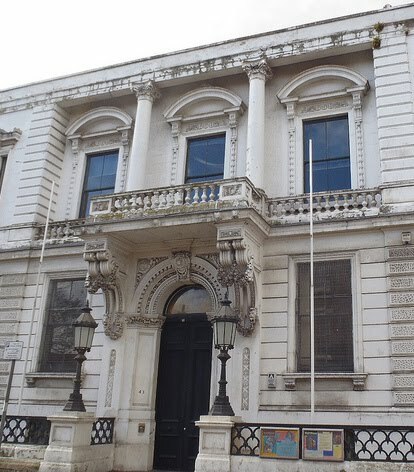 However, the organisation dates back much longer than this, to 1910, when notable local Muslims established the London Mosque Fund to build a mosque. By 1926, the fund had grown considerably, and the first Mosque was opened in three houses on the Commercial Road, E1, in 1941. 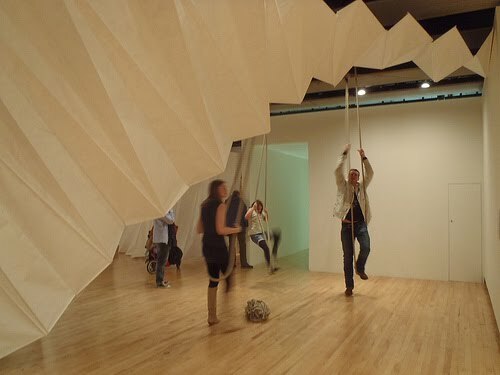 Your author has always been a big kid when it comes to installation art, and as such the latest offering from the Southbank Centre's Hayward Gallery, titled Move: Choreographing You, is exactly the sort of thing which he likes. Visitors are offered the chance to interact with a real variety of installations and sculptures by visual artists from around the world. It is great fun, and with hula-hoops, see-saws, climbing rings and ball rooms, you are given opportunities to do things normally reserved for children. The only problem is that they also allow children in. A highlight for your author was Isaac Julien's Ten Thousand Waves which presents three gripping stories over nine free-hanging screens in a fifty-minute film which draws upon the Morecambe Bay tragedy, when a team of Chinese cockle-pickers perished as tides rose. This, combined with stories from Shanghai and rural China, could have kept the audience there for hours. 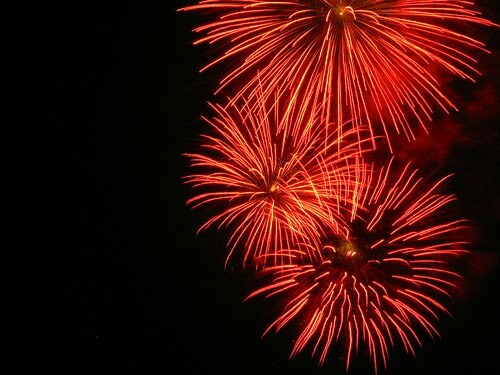 For more on the show, which costs £11 and runs until Sunday 9th January 2011, click here. Founded in 1967, and named after its owner, the William Weston Gallery is located in the Royal Arcade, W1, and prides itself on being the longest established specialist gallery in England dealing in European and British Master Prints. 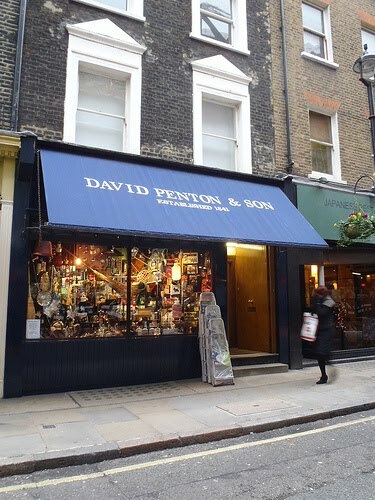 It is a commercial art gallery, but boasts that works which once hung on its walls are now in more than 50 museums and public collections around the country, and that Mr Weston himself is often called upon to act as a consultant and valuations advisor for 'proper' galleries and museums. It's a pleasant little space, and only takes a few minutes to browse the works on offer, unless you're trying to prove that you really know about art, in which case you have to stare for ages. All the works, when your author popped in last week, were sadly beyond his means, but probably best that it is left to other people to buy them anyway. They will appreciate them more. 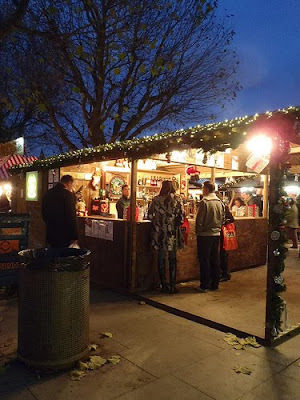 Your author is reluctant to feature anything which bills itself as 'Christmas' themed so early in the year, but there is something rather pleasant about wandering the German Market which set up on the South Bank last week. With the temperatures now distinctly wintry, you have to take your chances to be in the open air where you can get them, and the market at least lets you sip warming Glühwein in an M.D.F. 'Chalet', or take your pick of ales from the Outside Inn. There are also various German and non-German foodstalls, selling Bratwurst and other dishes which appear to vary in quality between tasty-looking and pretty ropey. There are, of course, also the usual tat and gift stalls, and also an awful-sounding 'Santa’s Secret Village', which should be avoided like the plague. It's a nice spot if you're looking for somewhere to wander, but it will probably get busier and you will only want to go once. Now in its third year, the market is only featured here to get it over with before the decent seasonal-offerings open up. Amongst the largest inside the M25, Queen Mary Reservoir is in outer London, just to the west of the M3. It covers 700 acres, and has been providing water for thirsty Londoners since 1922. 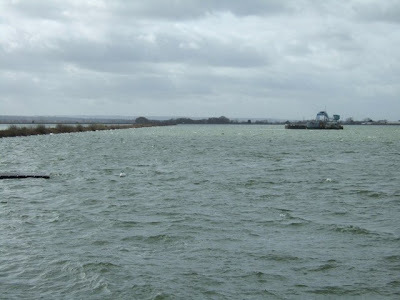 For some, however, that is not enough, and the Queen Mary Sailing Club have been taking to the water since founded in 1972, and have been providing full programmes of racing and training since then. Whilst learners must take lessons, competent sailors can apply for day membership for £12 during the week, or £16 on the weekend, and the club has a range of equipment available for hire, providing you can prove your credentials and subject to the discretion of the duty officer. It wasn't that sunny when your author last visited, but Wendy Taylor's Timepiece sundial, installed in 1973 beside the lock where St Katharine's Dock joins the Thames, is certainly striking. 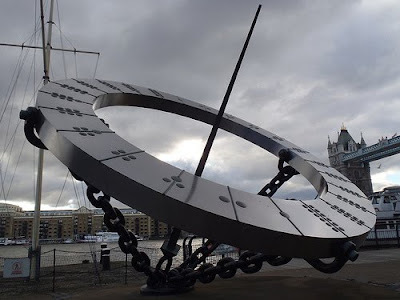 The dial is apparently, a large equinoctial sundial around 3.66 metres across, and in the form of a stainless steel ring, which is supported by three rigid chain link cables. A short distance from the hustle and bustle of Oxford Street, and Edgware Road, the Carpenters Arms, in Seymour Place, W1, is a great little pub that provides a haven from all those people buying things they don't need. Apparently established in 1776, and rebuilt in 1872, it is owned by Market Tavern, a small family-run pubco, with establishments in various places. It claims to be home to the London branch of the Campaign for Real Ale, and whilst your author isn't sure if this is correct, it does have some fantastic ales on tap and the array of pump clips on show is a testament to this. 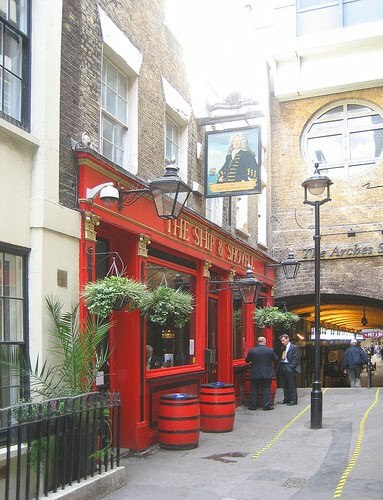 It's also a sport pub, but not in an overbearing way, and when your author was last in it had a mixed crowd of after-workers and all-dayers pleasantly whiling away their time. The Half Moon Young People's Theatre, at 43 White Horse Road, in Limehouse, was first established in the 1970s as part of the now defunct Half Moon Repertory Theatre. When it's parent theatre went into liquidation in 1989, the youth branch struggled on, establishing itself independently in 1990. Since then, the theatre moved to its its current premises in 1994 with an injection of cash from the London Docklands Development Corporation and European and Social Regeneration funds, and has been carrying out its mission of using drama and theatre to aid the learning and engaging of young people, and putting on seasons of productions which are open to the public. Apparently a place of worship for over a thousand years, the first church was built on the present site of site of St Dunstan and All Saints, Stepney, 'sometime between St Augustine's conversion of the English in the 6th century, and 952 when a second church was erected on the site by St Dunstan', which is fantastically vague. 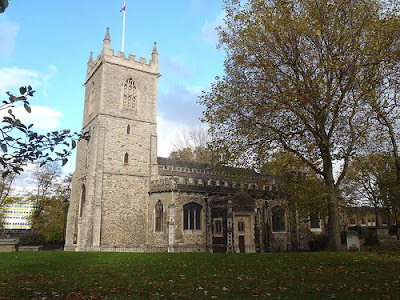 Your author doesn't have religion, but it is getting to be a bit of a habit to examine church histories here, so let's take the time to examine St Dunstan's, Stepney. Originally called All Saints, the church was probably named after St Dunstan, the former Abbot of Glastonbury Abbey, Archbishop of Canterbury and Bishop of London, at some point following his death in 1029, and in 1896 the names were combined. The only part of the original church which survives is a tenth century stone relief panel of the Crucifixion, beneath the east window. The 'modern' church was built between the thirteenth century, when the chancel was built, and the fifteenth century, when the nave was built, to serve residents in what was then a country retreat. 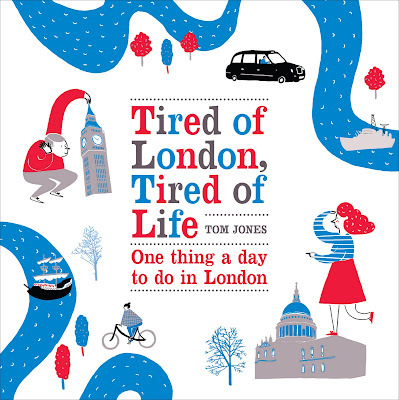 As such, it is notable for having survived both the Great Fire of London and the Blitz. For more on St Dunstan and All Saints, visit the website here. The American Bar, at the Stafford Hotel in Mayfair, dates back to the 1930s, and since the 1970s has been the venue of an interesting tradition. 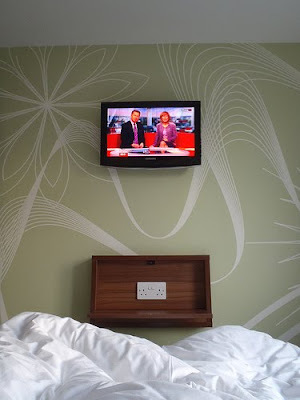 Started when West End hotels began looking to the increasing American market arriving by ocean liner, it is now more famous for the tradition of guests leaving personal gifts for the hotel, which have over the years covered the walls and ceiling. Your author popped in the other night with Rajul from London Hotel Insight, and found a spot amongst all the paraphernalia for a very pleasant drink, attended to by Benoit Provost, the head barman who has been at The Stafford for 12 years. The tradition began, we are told, when the walls were so bare that an American guest gave Benoit's predecessor a small wooden American eagle. This was duly followed by an eskimo, given by a Canadian, and a Kangaroo, given by an Australian. 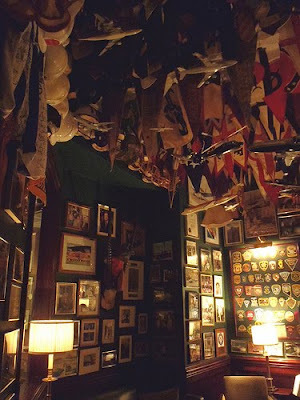 Today, the bar is covered with yacht club flags, signed photographs and historical artefacts. These are kept alongside glasses which various royals have used on their visits, model aircraft from pilots who drank at the bar during the Second World War, given on their returns, and photographs of Nancy Wake, the highest decorated woman of the Second World War, who drank here when it was run by Louis Burdet, famous for his time as a leader of the French Resistance. The only downside is the cost of drinks. This being a hotel in Mayfair, a pint is at least £5, so it's currently more like drinking in the Euro-zone than in America, and there is also the dress code - Jackets are mandatory for men. All this, and your author can't help wondering who will be the first hotel to beat the rush to designate a "Chinese Bar". For more on the American bar, and see some better pictures, click here. 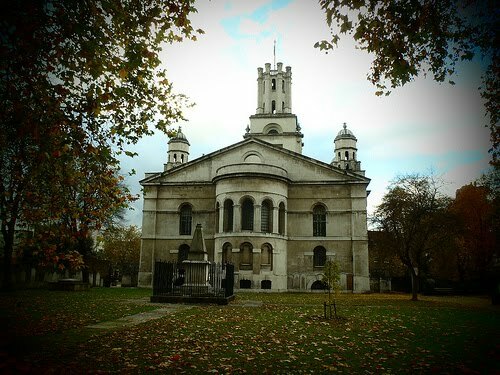 Designated with a Grade A listing, St George in the East is one of the Six Hawksmoor churches created in the Eighteenth Century by the New Churches in London & Westminster Act, St George in the East is on Cannon Street Road in Shadwell. When it opened in 1729, we are told, parts of the area then known as 'Wapping-Stepney' were still quite rural, with some open fields, and the area was only beginning to develop. 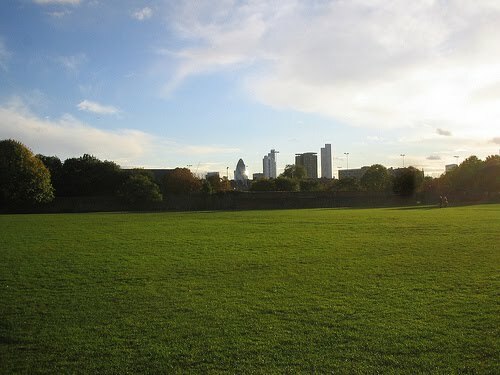 The area urbanised with the rise of the docklands, and was known for the production of maritime rope and cable - indeed, Cable Street was once the length of the standard cable measure at 600 feet - with the population increasing from around 300 houses in 1780 to nearly 49,000 at the time of the 1861 census. In 1836 the parish was constituted as a Poor Law parish under the Poor Law Amendment Act 1834. For a full fascinating history, see http://www.stgite.org.uk/history.html. Today is Remembrance Sunday, so your author thought it fitting to feature the Field of Remembrance outside Westminster Abbey. Every November, The Royal British Legion establishes a Field of Remembrance outside the Abbey, to remember the fallen. A sea of Remembrance Crosses with poppies on them are placed as tributes to ex-Service men and women who made the ultimate sacrifice to protect their country. 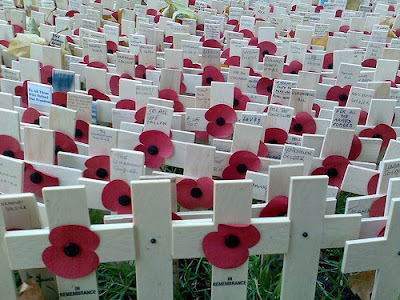 Families and friends place crosses to remember loved ones, friends and comrades who are no longer with us. It is a poignant reminder of those who have made the ultimate sacrifice. This year, it was officially opened by the HRH the Duke of Edinburgh on the 11th November at 11am, and is open daily from 9am to 4pm from 11th November until 21st November. Not often us commoners get to lay eye on a Lord Mayor, but the new one will be out today, riding around in his shiny coach and waving at the likes of you and me, for today is the day of the Lord Mayor's Show. 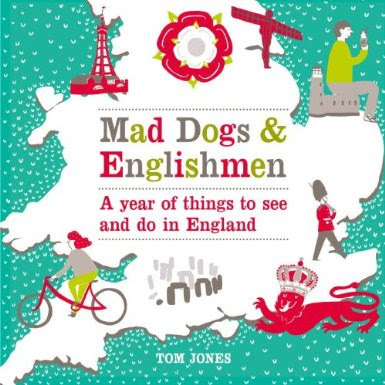 Lord Mayors have been coming out for the show for nearly 800 years, marching - we are told - through everything from the black death to the blitz. Famously, the only time the procession has been cancelled was for the Duke of Wellington's Funeral in 1832. 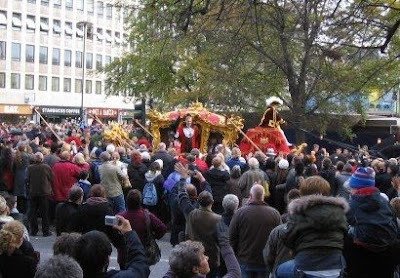 The procession sets off from Guildhall at 11am, passing Mansion, Bank and St Pauls to deliver the new Lord Mayor to the Royal Courts of Justice on the Strand at about 12.40pm. 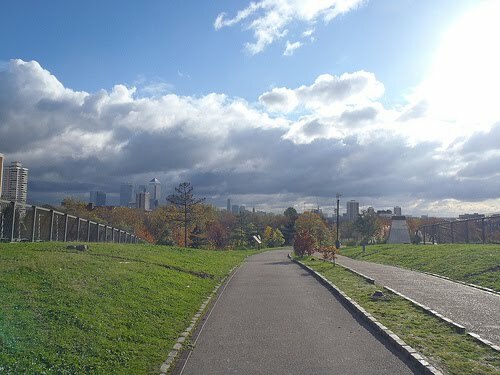 When the designers were creating the 90 acre Mile End Park, in London's East End, they were keen not to let Mile End Road, which bisects the park, spoil its linear design. For this reason, they created the Mile End Green Bridge, a living bridge which carries the park over the Mile End Road with grass and plants on either side, suspended in mid air. Created with the help of a Lottery grant of £12.3 million from the Millennium Commission, and designed by local resident and architect Piers Gough, the foot and cycle bridge, spans 25 metres and five lanes of traffic to unite the south and north sides of the park. We are told that 75,000 drivers pass underneath every day. For more on the bridge, see here. If you live in Central London, there's a good chance that your telly comes from the Crystal Palace transmitter, in Crystal Palace. It transmits the signal for BBC One, BBC Two, ITV1 and Channel 4, FM radio and digital terrestrial by magic TV and radio waves. 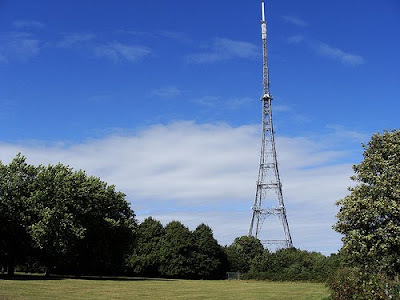 The transmitter is London's third-tallest structure, and from its construction in the 1950s until the completion of One Canada Square at Canary Wharf in 1991 it was the tallest in London, standing as it does 219 metres tall. Whilst it is visible across South and Central London, it isn't really until you get up close that you get the real scale of the thing. When your author visited for the first time back in the summer, he was amazed. He is only sorry that at this time of year he can't guarantee the weather, and that you will be able to see the top today. 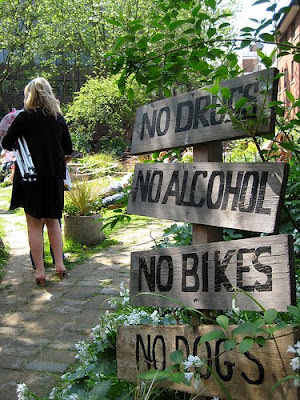 The Phoenix Garden is a community garden located in St Giles district of Camden, just behind the Phoenix Theatre. It was designed to give people working in the West End a green retreat and a chance to see some nature. Started in 1984, it is maintained by volunteers from a registered charitable trust who created the garden on the site of an old car park, which had previously been a Second World War bombsite. 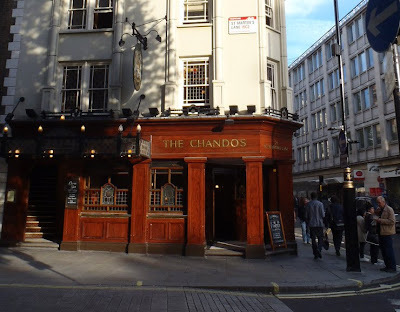 Your author can never quite decide whether he loves or hates the Chandos, on St Martins Lane just off Trafalgar Square, but it is certainly worthy of a mention as one of London's most central pubs. One of a number of pubs owned and operated by the Samuel Smith brewery, in Tadcaster, North Yorkshire, its spartan interior has two levels, with the downstairs bar largely open except for large booths along the windows and an upstairs bar with a more comfortable feel. If you can get hold of a booth downstairs and a swift half of Pure Brewed Lager or an Old Brewery Bitter, and it's quiet it can be very pleasant. If, however, you find yourself upstairs in the Opera Room on a Friday evening you will find it so busy you will wish you'd stayed at home. Regardless, it's a fairly decent pub with an interesting interior and good value unbranded drinks. Whilst the pub purists from Sammy Smiths are in charge it's definitely worth a look. For more, see Fancyapint here. 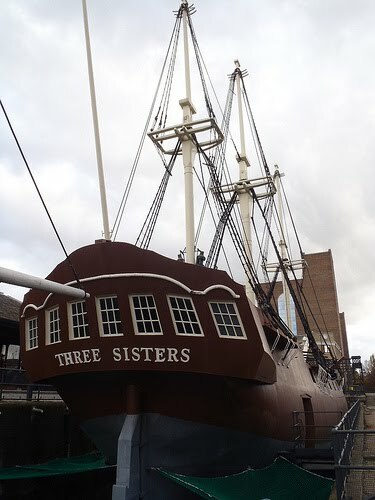 In front of Tobacco Dock, the huge 1990s shopping folly built in a grade I listed warehouse in Wapping, sit two metal 'pirate ships', forever becalmed in a dry dock sealed off from the neighbouring canal. In truth, on closer inspection these are not real ships, and were built to entertain the children whose parents never came to shop at a shopping centre which never was. The Sea Lark, apparently a copy of a 330 tonne tobacco and spice ship built at Blackwall Yard in 1788, was designed as a pirate ship for children, and the Three Sisters, a copy of an 18th century American built merchant schooner captured by the Admiralty during the Anglo-American War at the start of the 19th century, was designed as a floating pirate museum. They have long since closed, and are now home only to Health and Safety fines. With the shopping centre having stood virtually empty for around twenty years, the real Tobacco Docks having long since been filled in, and these ships never having been used it's all quite sad really. Maybe with the resurgence of interest in piracy someone might open them up one day? For more on Tobacco Dock, see an excellent article on Londonist here. Owned by the National Trust, Red House, in Bexleyheath, is the only house which exists which was commissioned, built and lived in by William Morris, the celebrated founder of the Arts & Crafts movement. Completed in 1860, it is built in the red brick-and-tile domestic vernacular style, it apparently shows a focus on natural materials. The Grade I listed building is noted for its gardens and its beautiful stairway. 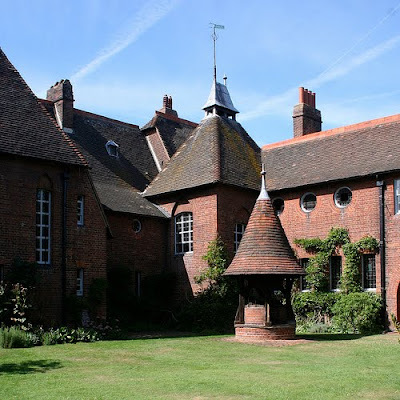 Morris himself only lived here for five years, being forced to sell the house for financial reasons in 1865, and it then became a family home for nearly 140 years, before passing to the National Trust in 2002. Nowadays, it is open to the public from March until December. For more information, see here. 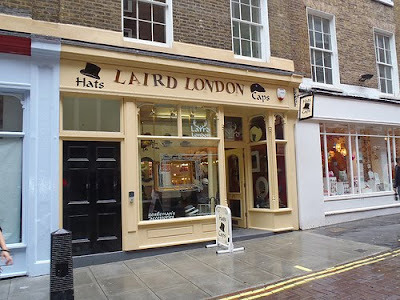 If you're searching for a decent hat, and have plenty of money to spend, you should probably have a check in Laird London. From Bowlers to Trilbies, Bowlers to Pork Pie Hats, and flat caps to Deerstalkers, they claim to add a contemporary twist to older styles to keep them in touch with current fashion trends. Laird is open Monday to Saturday, 11am to 7pm and Sundays from noon until 6pm. 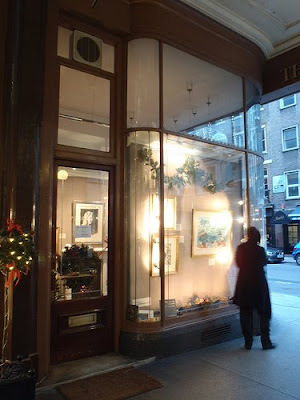 They have three shops, situated at 23 New Row, WC2, at 128 Columbia Road, E2, and at 6 Royal Exchange in the City. 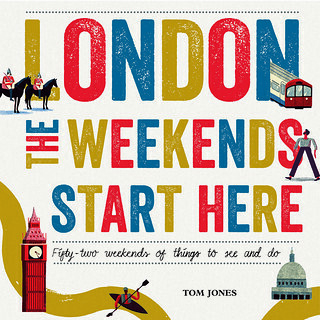 It's British Pubs Week this week, so your author is trying to crowbar in as many pubs as possible. 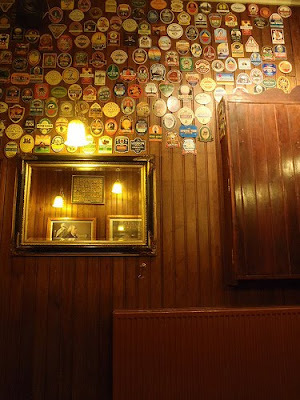 It is, therefore, time to mention a lovely pub up in Hackney, the Pembury Tavern. Built in the mid 19th Century, and closed in the late 1990s following a fire, and it wasn't until 2006 that it reopened, with links to the Cambridge-based Milton Brewery. Now it offers an amazing sixteen handpumps, and serves a selection of ales from the Milton Brewery, and other British microbreweries. It also holds three beer festivals a year, the next of which is due to begin on 17th November, daily food - including pizza - on an ever-changing menu, allows pets and offers free wireless broadband. It has its own Tuesday-evening chess club, and also offers draughts, Scrabble, backgammon, playing cards and dominoes. Given that they can fit in all this, as you might expect, it is pleasantly spacious inside. If there's anything else you're searching for, have a look on the website here. Now a nature reserve, which is part of the Lee Valley Regional Park, the original six Middlesex Filter Beds were created in 1852 in order to purify water for the surrounding areas and prevent Cholera, and were subsequently expanded. By 1969, the system of water cleaning had become outdated, with the building of the Coppermills Water Treatment Works in Walthamstow, and they were closed. By the late eighties, they had been the responsibility of Thames Water for many years, and had become overgrown, but teeming with wildlife. 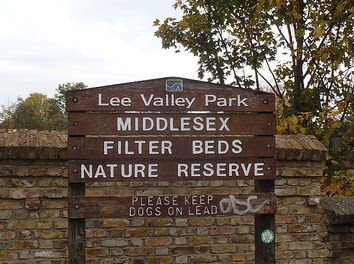 Seven beds were leased to the Lee Valley Regional Park and they now form the Middlesex Filter Beds Nature Reserve. The reed beds and other areas are, we are told, home to over 60 different species of bird, including Snipe, Reed Warblers and Sparrowhawk, and also amphibians such as toads, frogs and newts. Though the wildlife is possibly better in summer, they are open all year round and are free to visit. For more, see here. When the clocks go back, the dark nights can be depressing, but they are also a positive thing. 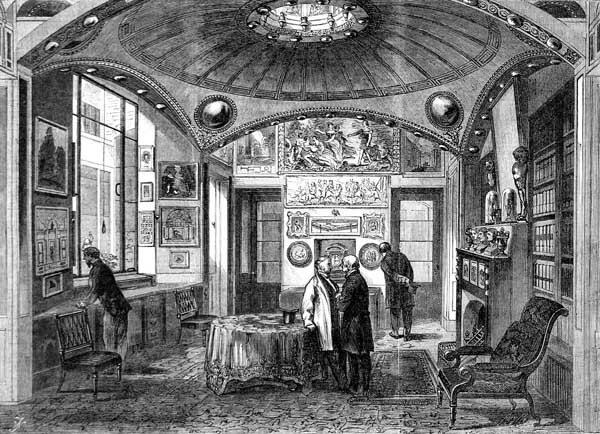 For tonight is the first time in months you have been able to fully enjoy the special candlelit openings at the Sir John Soane Museum in proper darkness. The openings take place on the first Tuesday evening of each month, from 6pm until 9pm, and are free, but you have to get there in plenty of time in order to get in, as the queues sometimes snake down the street. A rarity amongst pubs because it has an alleyway through the middle of it, the Ship and Shovell, near Charing Cross Station, is run by the Hall and Woodhouse brewery and, we are told, draws its name either from a nearby Coal Hole, or from Sir Cloudesley Shovell, who is pictured on the sign. Your author popped in on Saturday night for a swift half with friends tucked away in the tiny snug off the smaller, south-eastern, side of the pub. 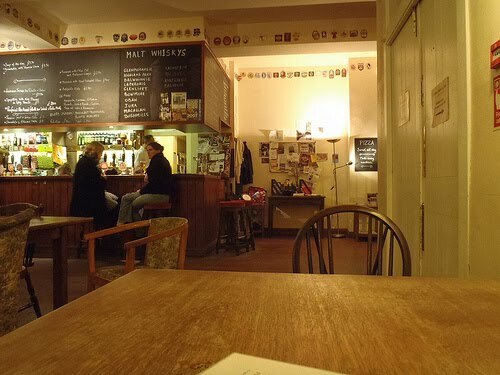 It was pleasantly quiet, and lacked the strong bleach smell of the main part of the pub, as well as benefiting from a tiny bar of its own, various nooks and crannies to hide away in, and even an upstairs 'Crow's Nest', which is available to hire. Probably established in Victorian times, the Badger ales on sale are drawn up from a linked cellar, through which drinks unavailable at the smaller bar have apparently been known to be passed by dumb waiter for discerning customers. A nice pub, then, but best avoided on Thursday and Friday nights when it has been known to be over-run by after-work drinkers, steeling themselves for the commute from Charing Cross. For more, see here.